Europe's deadly cold snap may have a lot to do with shrinking amounts of ice in the Arctic, a recent study suggests. Nearly 300 deaths have been reported across the continent, with snow accumulations not seen in five decades reported in some places. Warsaw, Poland, has seen 11 days of temperatures well below average, with a coldest reading of 35 below zero Fahrenheit. As warmer air rises into the stratosphere over the Arctic, colder surface air moves south bringing storms to Europe. 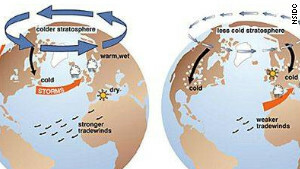 Scientists at the Alfred Wegener Institute for Polar and Marine Research in Potsdam, Germany, say the frigid, snowy European winter has its origins in a warm Arctic summer. The U.S. National Oceanic and Atmospheric Administration reported that July 2011 was the fourth-warmest July on record. A warm summer in the Arctic cuts the amount of sea ice. NOAA reports that sea-ice levels last July were the lowest in three decades. The effect is twofold, the Wegener scientists report. First, less ice means less solar heat is reflected back into the atmosphere. Rather, it is absorbed into the darker ocean waters. Second, once that heat is in the ocean, the reduced ice cap allows the heat to more easily escape into the air just above the ocean's surface. Because warmer air tends to rise, the moisture-laden air near the ocean's surface rises, creating instability in the atmosphere and changing air-pressure patterns, the scientists say. One pattern, called the Arctic Oscillation, normally pushes warm Atlantic air over Europe and keeps Arctic air over the poles. But in mid-January this year, the Arctic Oscillation abruptly changed, allowing the jet stream to plunge into Siberia and push cold and snowy weather over much of Europe. Similar situations have emerged the past two years. What's behind America's warm winter? You know the GOP has gone around the bend of extremism, when only candidates who don't believe in science are considered conservative enough to be President. Every candidate is a global warming denier. Nearly every GOP congressman is also in this non reality based camp. Whats wrong with this picture, is that these scientifically illiterate politicians, presume to know better than the entire world of science. At least 97% of active climate scientists agree on AGW. Virtually every major science organization in the world agrees on AGW. Over 100 science organizations of national and international standing have issued statements saying that AGW is real, and we must act immediately to reduce our emissions and avoid catastrophic consequences of global warming. That includes every national academy of science in the world. The U.S. National Academy of Science issued four such statements. The prestigious science journal, Nature, issued a statement this year, heavily criticizing the GOP for it's anti science posturing, especially on climate change. Only two professional science organizations, in the world, do not agree with the scientific consensus on global warming. And they are the only groups most GOP poiticians agree with. Canadian Society of Petroleum Geologists. The GOP is bought and paid for by the fossil fuel industry, especially the Koch brothers, who spent $25 million last year spreading climate change disinformation PR. And this disinformation is what FOX spreads every day. Another Murdock media outlet, the Wall St. Journal, is also notorious for this journalistic malfeasence. See: "Panic Attack: Murdoch’s Wall Street Journal Finds 16 Scientists to Push Pollutocrat Agenda With Long-Debunked Climate Lies"
Only a few of the 16 were actually climate scientists and only 2 had ever published peer reviewed climate papers in the past 30 years. And they are well known crank skeptics. The WSJ can print this piece of pseudo scientific rubbish Op-Ed, and yet wouldn't publish a letter from 255 members of the National Academy of Science on climate change. 3) The ICOC was established to PROVE that there is a link between man and rising temperatures INSTEAD of being given the mandate to identify the cause of rising temperatures – it is like the police trying to link a specific person to a crime instead of looking at the evidence to find the person who committed the crime. 3) ALWAYS ALWAYS ALWAYS avoid people who say "it is proven" or "Science tells us" because both statements are absolutely false. The only valid statement that can be made is "the data leads us to this conclusion" ...in no way can we say the data proves this happened. No one has ever said that climate science is 100% certain. Thank god for those shrinking ice caps- saved the ozone hole!!! Uh oh, wait a minute- shrinking ice caps are bad, but ozone hole is bad. Ozone Hole is gone, and you know why? I'll tell you why lol- because the liberals stopped us from using aresols LOL – you've got to love it people. And when global warming is proven, not to exist it will be because we gave algore enough cash, to help him persuade us to drive less- now the liberals not only closed the ozone hole, but also saved us from global warming- this is coming folks get prepared. algore has given us, all this plus he invented the internet- he is a god. Salrick – if your so sure of your claim- why do you need to go hog wild making 5000 posts- like a lunatic trying to hustle someone into buying a used car. Just state the facts – and let the facts speak for themselves. Oh there's a word- for you salrick facts – facts. I heard some windbag idiot – global warming hack- declare to us. With all the energy we are releasing, of course the climate has t oget hotter it's inevitable. Just wondered if he factored in all the energy we are absorbing, with air conditioning, does it have a counter effect. let the liberals chew on that. bottom line anything man does is bad, that's what they are trying to sell. it will be? What if media had covered caimlte change science as well as they did Toyota? Spread Love, not Wind Mills. No, bad weather is not our fault now. I am a Green-Liberal Climate Change Denier. Stop scaring our kids.IF YOU ARE STILL A BELIEVER AFTER 24 YEARS OF CLIMATE CHANGE WARNINGS, YOU ALSO:-trust politicians to manage the weather.-think humanity is stronger than Nature.-only human pollution stays in the air forever.-wish, pray and hope for this misery to really happen.-are a doomsday cultist because Climate Change is “unstoppable warming“.-unquestionably accept other peoples thinking.-deny any denial science.-make a religion-like virtue out of no evidence.-feel envy for anyone who has more than you.-accepts as your God as being a fat politician who promises to lower the seas with taxes.-call Bush a liar, but the fear mongering Gore and Canada’s Nutzuki are true saints.-think contracted consultants are scientists.-like scaring children with ‘DEATH BY CO2”.-think we are immortal gods who can kill the powers of Nature and the cosmos.-a participant in the Iraq War of science, Climate Change.History will not be kind.